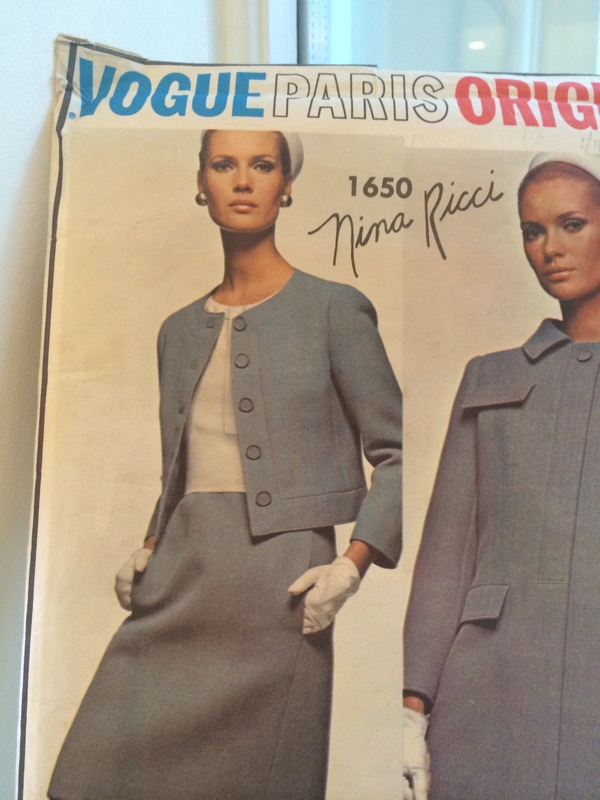 So I have decided to include the Nina Ricci suit in my SWAP. But the skirt, overblouse and jacket are three items – one more than I need. What shall I drop? I will have to give this some thought. I will start with making the skirt and camisole because this is a straight substitute for the charcoal “skirt” that I had not yet identified. The decision on overblouse or jacket can wait. I painted it in a nice range of colours but they bled quite badly. I found the same thing before when I used this technique, and although it bothered me when I made it, I actually love wearing it and don’t mind that the colours have mingled. I painted it on the reverse side as I had previous experience of the darts wicking the colours across the squares. This helped a little, but you can see the bleeding on the picture. The skirt part on the make was plain sailing. Two backs, one front and two pockets. No pesky waistband. I cut the front pockets with the skirt front, and attatched them to the back. The skirt is virtually the same style as my other SWAP skirt but a three gored rather than four. The two back pieces wrap around with no side seam, and the darting is in the two front seams that feature the pockets. Excellent, elegant design. Esme and I argued about the colour of the cloth. I had been convinced since I bought it at Simply Fabrics that it was charcoal, with a bluish hue. Esme said “It’s navy”. Well that came as a surprise, but it probably is. Is it possible that colour vision fades a little with age? This is not the first time I have been unsure of what I have been buying. Anyway navy or dark grey, it’s really, really nice wool crepe. Bouncy, a little bit stretchy, easy to sew, dense but not heavy. 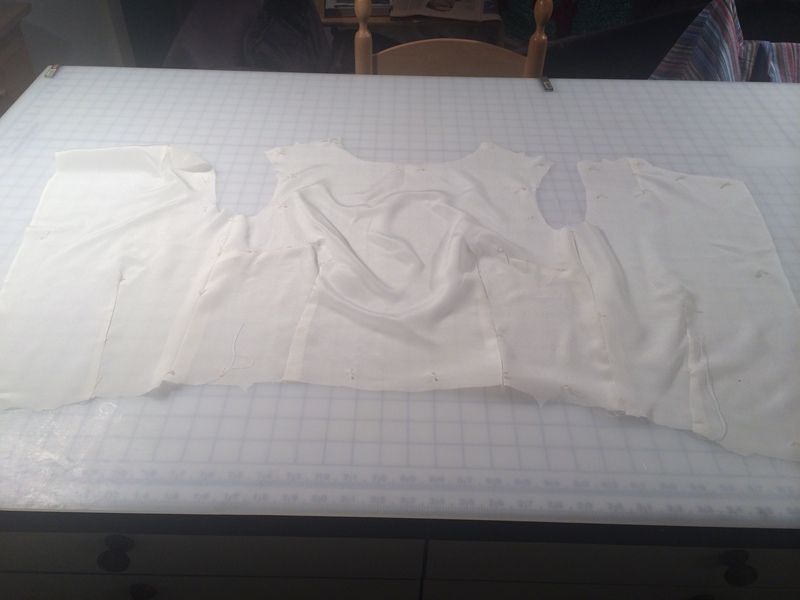 Having made up the skirt I lined the camisole in the same silk crepe and basted the skirt-without-a-waistband to it. The shape and style will work I think, but the colours are not quite right. I think I will touch up some of the grey ones to make it a bit deeper and to bring the skirt and top together. I have yet to line and hem the skirt, and insert the zip. Then I will do the overblouse. Or maybe the jacket. Your hand painted shell top is beautiful. Why not put off darkening the grey until you complete other items of your SWAP and see what it ‘looks’ like. I like the mid tone of the shell and think it goes with your light colouring. I love the pattern on the cami – very nice. I love the sound of the skirt design. It does sound elegant and very practical. I think this is going to be very pretty on you, and like Cheryl I would hold off perhaps on darkening the grey. You’re so clever with your printing! Re. colour – I find that with many colours I need to see them against other colours, i.e. change the context, to see the dominant tone. At my local sewing shop I need to actually take the stuff outside sometimes so I can see the colour better. Of course, I’m often stuck buying online, which doesn’t hep me much. Great start and the colors are just perfect…don’t make them darker! The jacket just makes me drool…remember when women really dressed like this??? Even stewardesses had designer gear! Oohh! Very pretty painting job. I can’t wait to see how this one turns out. The hand painted top is a winner again. I like the distorted grid lines and how the colours blend. And it works with the skirt in style. You probably don’t need this input Kate but… How great would that jacket look with the binding in a contrast colour?! Beautiful lining/ cami, I’ll never feel content buying pretty silks again! Thank you for the suggestion Sewniptuck. I love input. I need input. 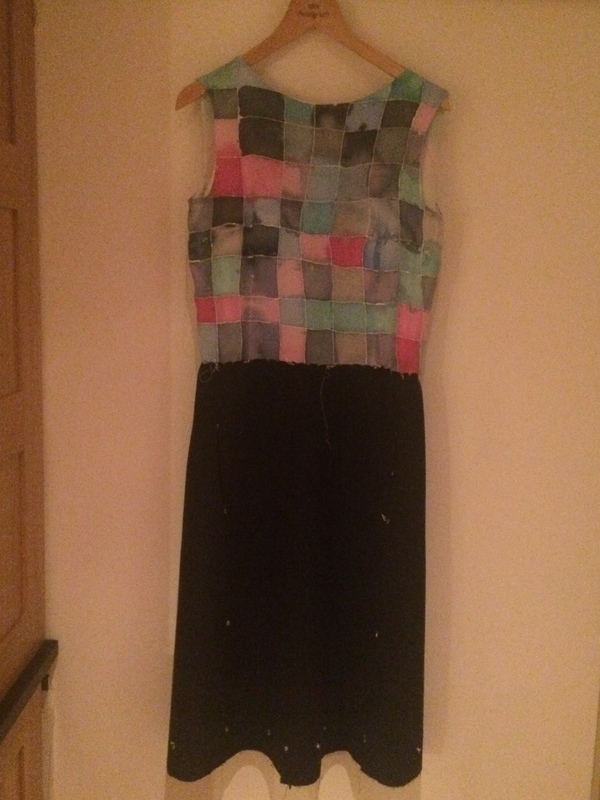 I am just sewing on my own, so I really appreciate feedback. Sometimes I adopt the advice, sometimes I don’t. But I do always consider it. With this jacket it is going to be plain but I may do another one and follow your suggestion. 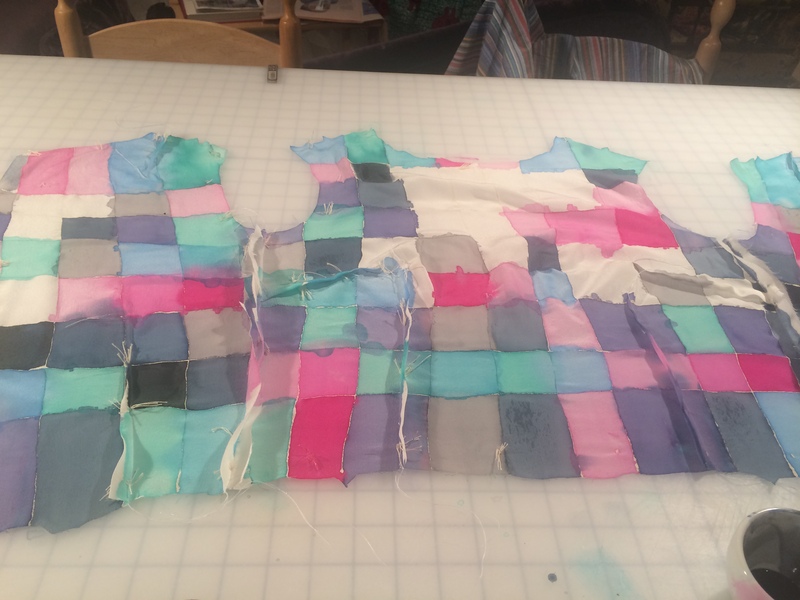 Have you ever done a jacket with contrast binding?